Grand Canyon Walking Track, Blue Mountains. One of the best buskwalks. The Grand Canyon Track is one of the best buskwalks the Blue Mountains has to offer. Wentworth Falls was my favorite hike in the Blue Mountains until I did the Grand Canyon Track. Evan’s lookout gets the walk off to an amazing start. The views are fantastic. The bush walk starts with a steep decline into the rain forest. From there you’ll enjoy hiking along the creek, come across a few waterfalls and walk under a series of rock ledges. I went a bit click crazy with the camera as there are plenty of great shots to get. The scenery is constantly changing on this 6.3km loop. You’ll need to have a bit of fitness about you as there a lot of stairs to negotiate. So don’t be fooled by the short distance of 6.3km. The trail head starts at Evans lookouts. There are excellent signposts around for the Grand Canyon Track so it’s hard to miss. Google Maps Link. In google maps type in “Evans Lookout”. This will bring up Evans Lookout, Evans Lookout Rd, Blackheath. Google maps will then give you directions. Coming from Sydney you’ll head up the Hume Hwy towards Blackheath. You’ll see a tourist sign saying Evans Lookout. Follow that along until you hit the lookout. As mentioned there are plenty of signs around directing you to the Grand Canyon Walking Track. Google Virtual tour of the start of the Grand Canyon track in the Blue Mountains. Grand Canyon Blue Mountains Trail Map. Grand Canyon Blue Mountains Photo Gallery. 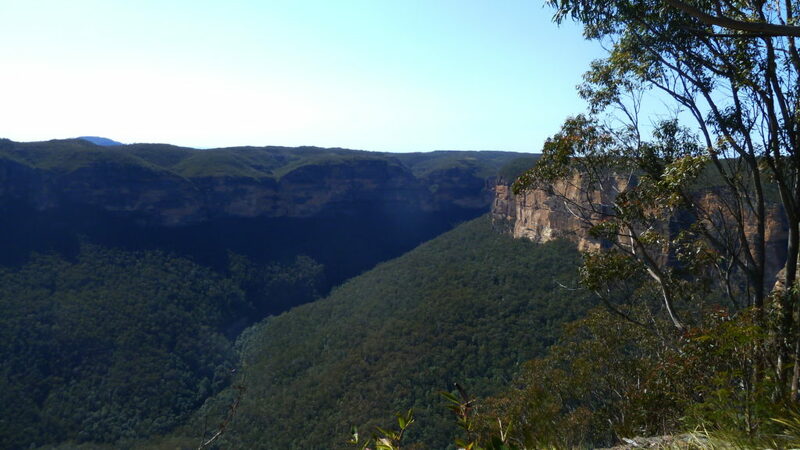 Blue Mountains, Grand Canyon Track, busk walk, bushwalk, trek, hike, hiking, trail, track, NSW, Australia, Grand Canyon Walking Track.